AR-15 Grips: An Easy Upgrade That Can Make A Difference. Whether you call it an AR-15, black rifle, or modern sporting rifle, the AR-15 is one of the most popular firearms. A major reason for this is the adaptability it has for any application in which you desire to use it. This weapon can be used for anything from hunting to shooting sports to home defense. It performs well in all of these categories because there are so many ways you can specifically modify it to excel in one or more of these applications. While some modifications can require special tools or an in-depth knowledge of the operation and design of the weapon, replacing a handguard, stock, or grip is something just about any AR-15 owner can do with a little research and understanding. In this blog post, we will discuss various "after market" pistol grip upgrades that are offered at www.del-ton.com and how they can help you enjoy shooting your weapon even more. Most AR-15 rifles will come with a standard "A2" pistol grip. The grip is well designed to make the weapon "shootable" for a very broad range of hand sizes and shooting styles. Many companies have designed grips for specific applications like hunting, combat, or accuracy-focused precision shooting that may be more beneficial for these particular applications than the basic A2 grip. 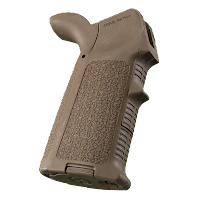 Magpul has an extensive line of AR-15 accessories, and the DTI product line offers their MIAD (Mission Adaptable) and MOE (Magpul Original Equipment) grips in three popular colors: black, flat dark earth, and olive drab green. The MIAD grip has replaceable frontstraps & backstraps to accommodate different hand sizes and includes a core insert that will hold three 5.56 rounds. Other core inserts that hold a spare bolt, batteries, etc... are also available as separate parts. The MOE grip also has internal storage, but does not come with any of the core inserts. The MOE grip does not have the interchangeable front and backstrap pieces of the MIAD grip. Both grips have a textured yet comfortable surface to help you maintain a good grip. The MOE+ grip is the same as the standard MOE grip, but with a rubber-like exterior for those who prefer the feel of a softer pistol grip. The Magpul grips also extend in the rear where the "web" of your hand is, for additional comfort. The TangoDown Battle Grip has an exterior much like the Magpul grips, but is slightly more thin and has a more "aggressive" angle. This can be beneficial for applications requiring quick, moving target acquisition. While the rear of this grip does not extend past the web of the hand, there is an extension in the front of the grip to cover the gap between a standard grip and the triggerguard. This is a nice feature as the gap can be abrasive on your fingers after a long day of shooting. The TangoDown grip also has internal storage capability, and is available in black and olive drab green colors at DTI. 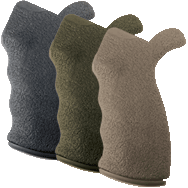 Ergo brand grips are appropriately named...they are VERY ergonomic and comfortable. They come in "rigid" (a harder plastic-but softer than the Magpul and TangoDown grips) and "sure" (softer-like the MOE+ grip) styles. They are also available in right hand and ambi models. The back of most Ergo grips, like the Magpul grips, extend past the web of the hand and include a "gapper" for the space between the front of the grip and triggerguard. The Ergo grip also has an internal storage capability, but the plug for the cavity may have to be purchased separately depending on the model. The Ergo Tactical Deluxe Grip is slightly shorter in length, but with a fairly large "palm swell" that some users prefer for more slow, precision shooting applications. While upgrading a grip is not a major change, it is amazing how much difference the grips mentioned in this post can make in the comfort, performance, and even appearance of your valued weapon. Thanks for reading our blog; if you have any questions about the parts mentioned, DTI rifles, or anything about the AR-15 rifle, please feel free to contact us! The AR-15 is a similar design to the M16 "family" of military weapons. To some AR owners, the term "mil-spec" is important, and it makes sense in that the military has stringently tested the quality and reliability of the weapon and laid out specifications to ensure these characteristics. If a high value is placed on a weapon being "mil-spec" in every way, why not choose ammunition that is of the same level of quality as the weapon? DTI AR-15 rifles are chambered in 5.56X45 NATO, so both 5.56 and .223 Remington ammunition is safe to use in them. 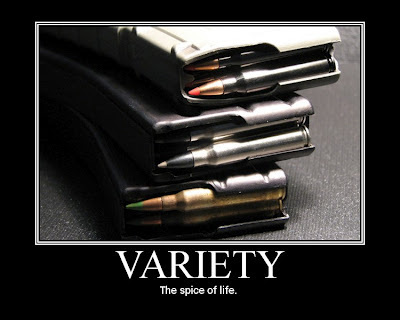 5.56 ammunition typically has more velocity and higher chamber pressures than .223 ammunition. This potentially higher chamber pressure and size differences in the leade (throat) of the two weapons are reasons it is dangerous to use 5.56 ammunition in a weapon chambered only for .223 Remington. The selection of 5.56 ammo is a bit more limited, though recent military activities and developments have increased available options. 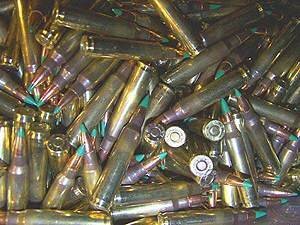 Not long ago, almost all 5.56 ammunition was loaded with "ball" ammunition/FMJ (full metal jacket). There are now a few different manufacturers that produce 5.56 ammo with "open tip match" or expanding bullets. Ammunition in .223 is also fine to use in your AR-15 and the available ammunition options are much greater in this caliber. From FMJ to expanding solids to various hollow point designs, a perfect option for just about any shooting application can be found. Both 5.56 and .223 ammunition is available in a variety of bullet weights (grains). 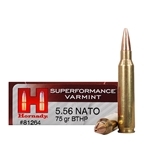 Typically, the lighter grain bullets are more suited for varmint hunting and target shooting/plinking, while a heavier grain bullet will perform better in situations like deer hunting or self defense. There is a line of thought that the lighter weight bullets are more accurate with slower twist rate barrels (1X9), while heavier bullets perform better in a faster twist rate (1X7). DTI rifles with 1x9 twist barrels that were featured in recent publications/tests achieved sub MOA accuracy with bullets as heavy as 77 grains. Each individual weapon is different and can show a propensity to favor one type/load/weight of ammo over another in terms of accuracy as well as reliable functioning so it can be beneficial to try some different brands and types of ammunition to see what offers the best performance in your weapon. It is always our suggestion to use quality American made ammunition. Some brands produced elsewhere may be manufactured with lower quality components such as powder that does not burn consistently (creating lower pressures) and can affect the reliable functioning of a semi automatic weapon. Not all ammunition produced in other countries is bad, but it is wise to research user reviews and other information before purchase/use. In this economy it can be tempting to select a cheap brand of ammo, but do so with caution. Whatever you do, don't buy it in large quantities until you're sure of its performance. Treat your weapon well. Feed your valued gun ammo that will allow you to enjoy the shooting sports without concern. Clean your weapon after use, and always remember to practice safe weapon handling. Thanks for reading our blog. If you have any questions about the DTI rifles and the other AR related products we sell, or even about the AR-15 in general, please contact us.